I reviewed the first installment of Fantasia last September (shocking that this feature closes by the end of this year) and felt that the 1940s experiment in music and animation was a “pretty screensaver;” so I wasn’t too excited to watch the failed continuation of the series, Fantasia 2000. 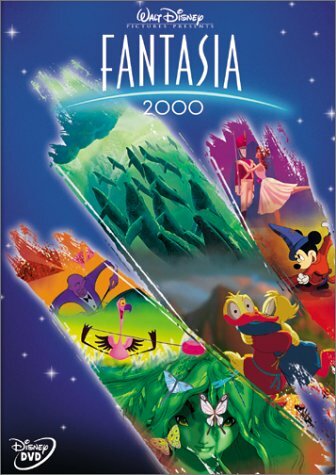 I’ve been surprised a few times covering this series, and watching Fantasia 2000 is just such a surprise. I still wouldn’t pop this in my DVD on a whim, but the movie isn’t as dour as the original attempt with fun stories that aren’t as esoteric (although the early 2000s CGI is still questionable). It’s easy to understand why Fantasia 2000 never opened the door for continued installations (as the original did in 1940), but it is an unforeseen gem. The original Fantasia aspired to be a serious film with hopes of turning on children and adults to classical music through animation. While it has its own devout fans, I was less than impressed, except in the case of “The Sorcerer’s Apprentice” which felt the most like a Disney cartoon. It either worked so well in the original, or the animators wanted to remind the audience that this was a Disney movie, because in the brief runtime of Fantasia 2000 they put it in the original “Sorcerer” animation; no changes, no upgrading the animation, the same short. Yes, it takes us back to the roots of Fantasia and gives that dose of Mickey Mouse, but it’s also as if the animators didn’t want to do a new Mickey short and relied on what worked. It’s always a fun short to watch, but if you’ve watched the original Fantasia recently, you’ll want to skip past it; and with only an hour and fourteen minute runtime, I wanted something wholly original. The rest of the segments range from good to really good; there’s little bad in this, overall. 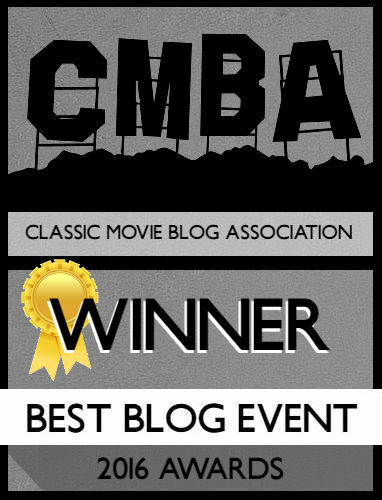 The opening segment, themed to Beethoven’s Fifth Symphony, conjures up images of the original Fantasia where color was splashed indiscriminately at the screen. It soon segues into the humpback whales sequence that is lovely, although the animation is that bizarre mix of early CGI and hand-drawn animation that would look even weirder in Dinosaur. It is a lovely sequence, with “The Pines of Rome” being a delicate and beautiful accompanying song. The strongest segment, from an animation standpoint, is the “Rhapsody in Blue” number. 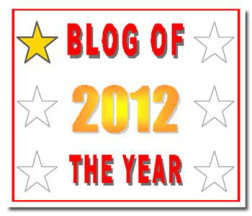 The song presents a clear plot about the drudge and hustle of New York City life with a dull color palate of light colors that lends an odd note to the song. 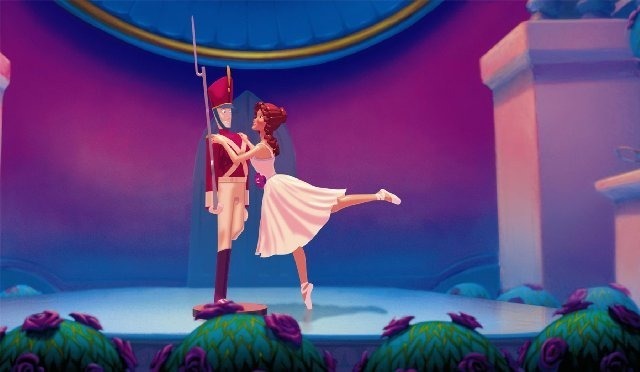 My personal favorite was the story of the “Steadfast Tin Soldier,” mainly because I enjoy the fairy tale, but also because the song and animation is fantastic. There is a weird waxy sheen to the characters, again the early use of CGI, but it gives an advantage to the animation; the toys are in that uncanny valley so you can believe they’re real. “Carnival of the Animals” is a throwback to the “Dance of the Hours” segment from the first, only this time it involves a flamingo getting a hold of a yo-yo. It’s a fun segment although very brief. 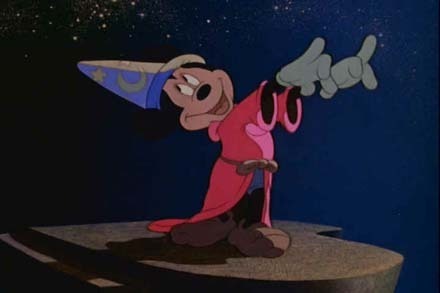 “Pomp and Circumstance” uses the titled song to create its own “Sorcerer’s Apprentice” (which only emphasizes that the Mickey segment is unnecessary). In this one, Donald Duck is working for Noah – of the fabled ark – to gather all the animals, two by two. It’s a fun story and Donald is an expert at being the manic Job of stories like these. The final segment is “The Firebird Suite” following a forest that’s decimated; it’s got beautiful animation but can leave the movie on a down-note. What actually ends up dinging Fantasia 2000 is the Disney ride quality it employs. If you’ve watched any of the recorded presentations shown within the Disney theme parks (Honey, I Shrunk the Audience immediately comes to mind) you’re aware of the random stars who just pop up with an “Oh, hi there. I’m [insert name of star who was popular ten or so years ago].” The original was about the music, as evidenced by the conductor being the one discussing the songs. Fantasia 2000 has every actor with a long-standing relationship, or who have voiced characters in a Disney movie, appearing to introduce the songs. I can understand stars with musical backgrounds such as Bette Midler or Angela Lansbury arriving, but others like Steve Martin and James Earl Jones are distracting; Martin is especially, as the first presenter who sets up an uneven tone with wisecracks. None of these stars will excite the children watching this – sadly, I’m sure children today would ask who a few of the stars are – and it makes the film feel like an awards presentation. Fantasia 2000 failed at the box office, and put the final nail in the coffin of resurrecting and adding new segments to Fantasia every couple of years. When Bette Midler presents footage from segments that never made it into the film, both this and the original, it’s sad. Fantasia continues to be a bold experiment, and it’s startling that the company decided to give it a second chance in 1999. The animation is livelier, as is the music, and I enjoyed Fantasia 2000 far more than I anticipated; that still doesn’t mean I’d have seen subsequent performances. With the ’90s coming to a close, Fantasia 2000 became an ominous prophet (in hindsight) of the company’s desire to remain true to its roots – in a campaign spearheaded by Roy E. Disney – and moving into gimmicks and 3D – controlled by Michael Eisner. The entry into the 2000s would see Disney make drastic changes, including the eventual disbanding and removal of the 2D animation unit…but that’s a story for another time. NEXT WEEK: Actually, Journeys in the Disney Vault will be taking a five week break. On August 24th, we’ll return with a look at Dinosaur, kickstarting the final fifteen films in the series. See ya then!